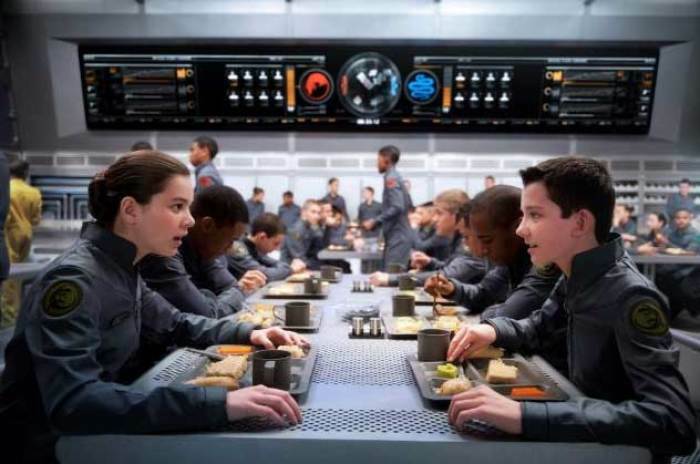 Does 'Ender's Game' Tell the Bible Story of Joseph? The new film "Ender's Game," based off the book by Mormon writer Orson Scott Card, may carry some Christian themes, and one reviewer claims it mimics the biblical story of Joseph. The film "parallels directly Joseph's dealing with this brothers," Robert Hamel, assistant professor of Theatre Arts at Westmont College and a Lutheran pastor for 29 years, told The Christian Post in an interview on Thursday. Hamel compared the character Ender's crisis of conscience to Joseph's decision to feed the very same brothers who once sold him into slavery. The film's main character, a 12-year-old boy named Andrew Ender Wiggin – known simply as "Ender" – plays a military game to destroy the Formic, a giant insect-like race invading Earth. While Ender thinks he's just playing a game, he's thwarting a threat to destroy mankind. "When he finds out in the movie that he's annihilated an entire civilization, he has a severe crisis of conscience," Hamel explained. Seeing that the Formic are not a true threat and grieving for what he has done, Ender regrets destroying them. This crisis "is only brought to resolution when he can save a remnant of the enemy civilization," the professor added. Hamel noted that in Joseph's story, his brothers end up selling him into slavery, but God uses that opportunity to do miracles. Like Ender, Joseph ends up in the position of complete control over his enemies, and chooses to save them. When Joseph's family is hit with a famine, they come to Egypt requesting food, where Joseph has become a "food czar," as Hamel puts it. By feeding his brothers, who were his enemies, Joseph "becomes a vehicle for God to save Israel," the professor said. "Through Joseph's desire to seek reconciliation and peace with his brotherly enemy, the whole nation of Israel is saved," Hamel added, just as Ender saves the Formic after his crisis of conscience. The former pastor also shared the Christian significance of making peace with enemies. "For much of Christianity, there's a relationship to God which has everything to do with peace and reconciliation," he explained. Mending relationships is "a foretaste of salvation yet to come," and partaking in God's love by participating in the body of Christ is "living salvation now as opposed to a reward beyond death." The Huffington Post also ran an article discussing the Christian themes of "Ender's Game." Writer Danielle Tumminio compared Ender not to Joseph, but to Jesus. "Like Christ, Ender is different from other humans," she writes. "Like Christ, Ender has a mission of deliverance. And like Christ, Ender is controversial, beloved by his followers and hated by those who feel threatened by him." But there, the similarities end, Tumminio writes. "Offering himself on a cross, Jesus refuses to engage in violence, even violence that might protect his own life," she explains. "In contrast, Ender is pressured and manipulated into becoming a boy well acquainted with the power violence wields." "As Ender regrets his decisions, the viewer sees the message of Christ illuminated – that violence is not the way forward, that redemption comes another way…that peace and reconciliation are a means to salvation," Tumminio concludes. Bob Hoose, who reviewed the film for Focus on the Family's Plugged In review site, acknowledged the character development aspects which Tumminio said link Ender with Jesus, but listed no spiritual connections to Christianity in the film. Under his review's "Spiritual Content" section, Hoose lists no Christian or anti-Christian themes, except a tribal tattoo rumored to "speak for the dead," and a reference to the Muslim greeting "As-salamu alaykum." Hoose does acknowledge the other reviews' central point of peace and reconciliation, however. "Ender's deep love for his tender sister comes into play as he weighs the wisdom of being a peacemaker over being a warrior." "In a creative way, the movie uses Ender's family dynamic to show how the character of a leader is shaped," Hoose writes. In a society where families are only allowed to have two kids, Ender is the third – but his parents still value him deeply.